We love summer! It’s a great time to relax with friends and family, catch up on some outdoor activities, and brush up on your party planning skills. With event planner courses you can build on your current event knowledge, which will help add to your business and reputation! One of the most fun and challenging things you can master with décor training is the tablescape! A focal point of almost all events, the tablescape sets the tone for an event – whether it’s a birthday, wedding, or conference. 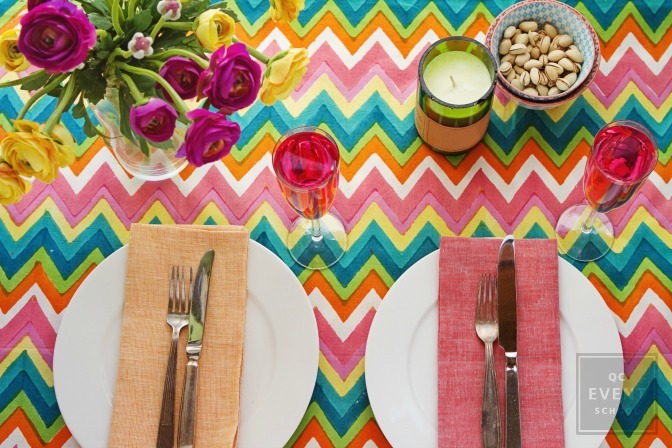 Keep reading to learn how to master the tablescape this summer! 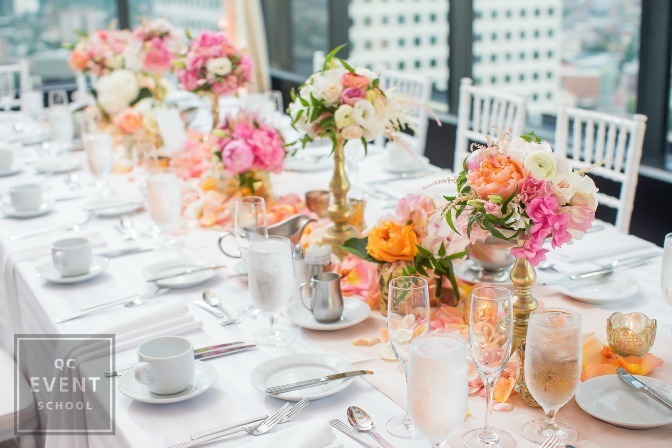 Color is a huge factor when it comes to event décor! Before you even look at a tabletop, make sure you sit down with your client and find out what color palette you’ll be working with! Find out about the goals of their event, if they want to follow trends, if they have a very specific vision in mind or if they need some guidance. Then bring all these elements together to come up with the perfect palette! If you’re doing a summer event a classic white and blue scheme is always sure to look great, but don’t be afraid of color! Summer is the time when people are most open to bright hues from their nail polish to their flowers. So if you want to suggest adding hot pink, lime green or neon yellow – go for it! No one is going to be more inclined to okay an electric blue table runner than a client throwing a summer party! Start with your large items first. Obviously, the first thing is to put down your tablecloth or your runner and then add large items like plates, chargers, and placemats. 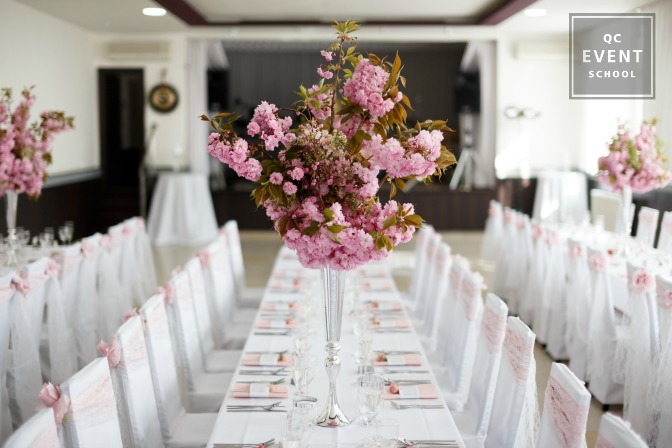 Planners often debate if they should rent or buy these event décor items and there are a lot of pros and cons for both options. There are two major blocks for buying supplies. The first is storage; you need to have somewhere to keep these items! If you don’t have anywhere safe and clean, you might be wasting your money if you accidentally ruin items or feel compelled to sell them due to lack of space. The second is that some items are not things that you will use more than once so there may be no point in purchasing them. This comes into play a lot more you do pick a very seasonal or trendy color scheme. You can also DIY certain tablescape pieces to get elegant décor at a much lower price! The centerpiece is another item that should be placed before adding details. Often this is a flower arrangement but seashells, lanterns, and edible items like lollipops, fruit, and vegetables can also be used. Pineapples and banana leaves are a popular combination for a tropical summer party. Sunflowers are another great choice to bring in some bright, bold color. Find some inspiration and get creative! After you have your large items set up it’s time to add in details. This is where you take your table setting from “nice” to “WOW!” Fill in gaps with smaller items like candles, single flower vases, and any other embellishments that you like. You can also include some lighting. When you add some candles, fairy lights, lanterns, or hanging lights above you add in a cozy glow and improve the overall atmosphere of your design. This is also the time to bring your color palette together! By adding your accent colors to these smaller details, you create a more cohesive look. Napkins, glassware, and votives are great tools for bringing out colors in a patterned tablecloth or multicolored floral arrangement. Play with texture and pattern to add visual interest. When you continue to add layers to a design, it often becomes more and more beautiful. Just make sure you know when to stop! After all, people do need room to use the table. Don’t forget to consider the occasion. Check the menu and the time of day. Are there multiple courses? Do you need dessert forks, salad forks, or soup spoons? Should you add citronella candles for outdoor pest control? Make sure your table has all the elements your client needs so that it’s both functional and beautiful! Make sure that you step back and look at your table from every angle! You might have holes or a serious imbalance if you don’t evaluate your design from different areas. You can have an asymmetrical design, just make sure that this was done intentionally and not by accident! Your first tablescape isn’t going to be your best one. Neither is your second or third or fourth probably! Just like in most things in life, practicing is the way to master table settings. Taking a party planner class is a great way to get that practice in and better yet, you’ll actually get feedback telling you how to improve! It’s the fastest and easiest way to go from event décor novice to industry expert and you’ll have a certificate to prove it. So start practicing! Go set up your dining room for a pretend wedding. Start with your color scheme and build your layers of details. Also, make sure that you take pictures so that you can compare your work as you go. Summer is a great time to improve your party planning skills. Use that extra daylight to your advantage and master those tablescapes! Sign up for a course and practice, practice, practice. Next time you handle event décor you’ll blow your clients’ mind.